FULTON – The Fulton City School District is committed to helping new teachers remain successful and feel valued. 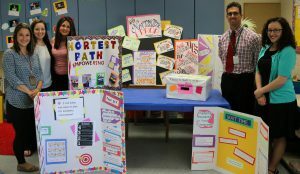 Teachers new to Granby Elementary School show off their display boards which were featured in the recent learning showcase for their colleagues throughout the Fulton City School District. Teachers who are new to Fulton schools have been encouraged to participate in a 36-hour course aimed to help strengthen their teaching skills and become immersed in the Fulton City School District culture. Granby Elementary School reading teacher Mary Ann DeMar, who teaches the course, said both new and veteran teachers will also learn a variety of collaborative methods to further engage students in learning. Teachers who are new to all buildings throughout the school district are offered extended support, mentor teachers and several classroom techniques in the professional development course. The course is based on the Doug Lemov book “Teach Like a Champion,” which focuses on several key topics, including: engagement of students in lessons, setting high academic expectations, creating a strong classroom culture and setting/maintaining high behavioral expectations. Guest speakers of various titles throughout the school district also shared with program participants how and why local educational initiatives are so important. The program, which began last school year, is supported by elementary, junior high school and high school principals. DeMar said since the district views teachers to be “new” for the first three years of their employment in Fulton schools, they are encouraged to stick with the program for that duration. Thirty teachers participated this year and recently shared their efforts with a learning showcase about achieving results they and their students deserve. DeMar is in process of helping develop the third phase of the course, which may roll out after the start of the 2016-17 school year.